A Training and Wellness Sanctuary for Dogs and their Humans! It was with grateful appreciation to be chosen as one of 4 organizations by Oprah and Cover Girl as Giving Back Beautiful. Donation went to New England Pet Partners. Maureen stretching with Tate on stability balls, a great way to build a strong core, balance, flexibility, and desensitize dogs to THINGS! More available in Awareness Centered Training - ACT, available at major booksellers. 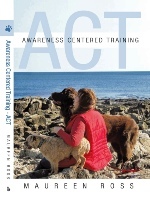 Awareness Centered Training - ACT, an educational dog training book that brings peace of mind to dog parents too! ACT is available in e-book and soft cover worldwide. Reviews at Animal Wellness Magazine / June-July Edition 2013, Vol 15. Like us at Facebook – and Share with friends. of potential therapy dog teams. Bringing people and pets together to enhance well-being and education with pet assisted therapy. Awareness Centered Training book signing event. Bring a dog – it’s a magnet to success! One of dozens of book-signings and events attended by Maureen with a great group of people at New England Author’s Expos. Pictured here with author/friend June Greig, A Dog To Remember. As the President of New England Pet Partners, I have had the good fortune to introduce ACT to health care facilities, universities and health care fairs. Engaging / connecting with people who are dedicated to making a difference for dogs and their people is a joy. Visit us on Facebook and You Tube - simply plug in these key words. 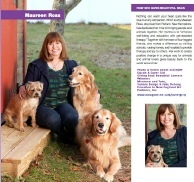 New England Pet Partners Inc.